I’d like to clarify statements made by Mr. Russell Williams, president of Hanover Shoe Farms (full story here). He states we tried to argue that the AS IS clause was no longer the law so we don’t have to go to trial and that we lost. We didn’t do anything resembling that. That was never our intent. Our first defense was it was standard practice to return such horses and that horses in conditions such as Eloquent Diva’s, the breeders would take them back. However, we did not want to rely on that defense alone, even though we thought we would be victorious. We filed for a summary judgement ruling on a breach of express warranty, which is the law in PA. We knew we had virtually zero chance of winning the summary judgement as it would strike down the AS IS clause. That would not happen. Judges seldom make summary judgements as they create precedent. This in no way says the judge ruled against us as was suggested. He simply decided not to grant summary judgement. Express warranty is when there is a communication by the seller or a representative of the seller to the buyer stating the effectiveness or positives of the item, in this case the horse. It may also include certain advertisements. Breach of express warranty voids the AS IS clause. Contrary to what was stated, there was such communication admitted at trial. The purpose of us to do this was to get this defense in as an option for the jury to consider in deciding the case. We wanted the judge to consider this going forward. As you can imagine, there was considerable discussion concerning this defense in judges’ quarters as the plaintiffs did not want it to be included. As you all now know, it was included as an option for the jury to consider and was included in the jury instructions. So, the reality of trying the summary judgement was in effect a win for us not a loss. If the jury decided I was in breach of the contract by not paying for the horse, they could decide that there was a breach of the express warranty by the sellers in which case we would still win. As it turned out, it was never required to consider this defense as the jury decided we were not in breach of the contract to pay for the horse. Upon reading the statements made by Mr Williams, I’m not sure if there was intent to give the impression that the jury may have felt sorry for me for having to pay for a horse destined to die and that they solely believed that and I still should have lost. Upon hearing the jury’s verdict, the judge thanked the jury and said, “You made the right verdict.” I guess that tells the real story. This does state one thing especially when buying a racehorse not a yearling. Seldom does a seller of a yearling train the horse and then say how good it was. If the seller makes incorrect statements concerning his horse such as he has never had surgery and you find that he had say throat surgery, in PA he may be in breach of an express warranty. Food for thought. Since I am both a small commercial breeder and an attorney, I read with great interest the Harness Racing Update on the litigation involving Richard Young’s purchase of a yearling filly named “Eloquent Diva” at the 2013 Harrisburg Yearling Sale and would like to give you my thoughts on the matter. The “Uniform Commercial Code” (U.C.C.) was formulated by the Uniform Law Committee in order to harmonize the various state laws that govern commercial transactions, i.e. the sale of “goods”, which includes horses. Each of the 50 states have adopted its own slightly different but basically the same version of the U.C.C. The U.C.C. provides that where the seller has reason to know of any particular purpose for which the “goods” are required by the buyer (such as training and racing in the case of yearlings), there is an implied warranty that the goods shall be fit for such purpose UNLESS SUCH WARRANTY IS EXPRESSLY EXCLUDED by the seller through the use of such terms as “as is” or “with all faults”, terms that are included in every sale catalogue that I have seen. The U.C.C. further provides that when a buyer has examined the goods before purchase, OR HAS REFUSED TO DO SO, there is no implied warranty with regard to defects WHICH AN EXAMINATION OUGHT TO HAVE REVEALED TO HIM. Pennsylvania has essentially adopted the foregoing provisions of the U.C.C. and they are therefore applicable to Mr. Young’s purchase of Eloquent Diva. I have no knowledge of the facts of this case other than what I have read in Harness Racing Update. According to the “facts”, as stated by Mr. Young, Eloquent Diva had a serious congenital heart defect at the time he purchased her, which condition his vet discovered two days later when he put a hand on the filly’s chest and immediately said “we have a problem here”. This condition would therefore have been just as evident to Mr. Young had he elected to have his vet “put a hand to her chest” before he purchased her. Where a buyer purchases a yearling “as is” and “with all faults and defects”, and did not have her examined by a vet before her purchase, which examination would have disclosed the defect he complains of, can he never-the-less refuse to pay for the yearling by claiming that the seller should have known of the defect? My answer to this question is “no” since I do not believe this to be the law in Pennsylvania, or any other state that I am aware of, and in my opinion this case should never have gone to a jury. It is the province of the trial judge to determine the law applicable to a given case and the province of the jury to resolve any dispute in the facts. However, the facts in Mr. Young’s case were undisputed and the law clearly supported the seller. The trial judge should therefore have entered a summary judgment in favor of the seller before trial or entered a directed verdict in his favor at the close of evidence. The judge failed to do either and the result was a “do right” verdict that was contrary to both the law and the evidence. 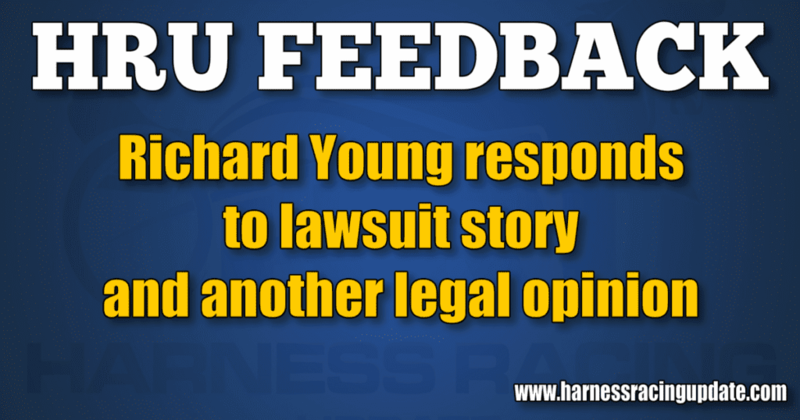 In any event, the judgment in Mr. Young’s favor does not set any kind of a precedent with regard to the sale of horses “as is” since it apparently was not appealed and only appellate courts can set precedent. Any change with regard to the sale of horses “as is” would involve a change in the U.C.C. or a change in the terms and conditions contained in the sale catalog. As a footnote, the version of the U.C.C. adopted by Kentucky specifically provides that there is no implied warranty that animals are free from disease or sickness UNLESS THE SELLER KNOWINGLY SELLS ANIMALS THAT ARE SICK OR DISEASED.